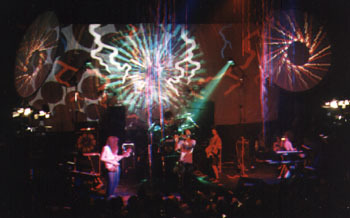 OZRIC TENTACLES at the Astoria Theatre, London, June 30th 1994. I don't think we're very much like the Grateful Dead," Ed Wynne informs me. "Not a lot like Moby either," Joie Hinton further clarifies. Thus Ozric Tentacles two main men (guitarist/keyboardist Wynne and keyboardist Hinton) respond to the Chicago Sun-Times' reductionist statement that their band is the missing link between the Dead and Moby. "Acid rock, with jazz and reggae bits, ethnic bits," Wynne lists, when asked to describe his band's music. But because nothing is quite obvious or clear-cut or absolute with Ozric, the Sun-Times statement (while technically incorrect) is symbolically in the ballpark. 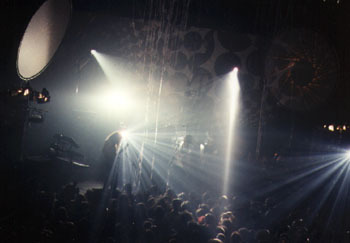 And while the band's space-wail and today's Dead's energy-free, slow-motion senility have little in common -"We do space jams, they do space jams," Wynne concedes- there is no doubt a lot of Deadheads would relate absolutely to our heroes tentacular groove, multi-sonic guitar attack and stupendous light show. "The light show is great when you're tripping," flutist John Egan observes knowingly. For the Moby-Orb-Ambient-Acid House- astronauts, well, Ozric Tentacles' music is so mesmerisingly trippy, hypnotically entrancing and ecstatically blissful, that with or without the big E you will be scaling the heights and roaming the space waves. All this is achieved through a sonic approach that appears, at first listen, very much anchored in a '60s/'70s ethos: The virtuoso guitar solos, long and sinuous, coming at you at decibel-happy volume. "It's loud stuff," says Wynne, "it's well loud on stage." The sub-surface funk of the bass lines and the circular-motion groove of the band would fit right in at the Fillmore on a night when Quicksilver could be jammin'with Jack Casady, Camel and Sensations Fix. However, a more attentive approach on the listener's part will reveal the intricate sequencer runs, subtle sampling loops and the wide-ranging phalanx of bloops, bleeps and homemade oddstruments percolating through the mix, giving the lie to any revisionist, retro-reading of this most modern band. The writing process goes in both directions: Jam and Structure. "Some and some," Wynne explains. "Sometime we'll get a new synth, I'll find a new sample and it'll trigger some ideas," he adds. For more control, or honesty, they only sample themselves. "We don't get library samples much. If we want a violin sound, we'll find a string and something to rub across it, and sample that and make it strange, if possible. That's why we like samplers, 'cause you can take anything and turn it into an instrument, and that's brilliant". You guessed it, Ozric Tentacles is pretty teched-up, despite not sounding it. "Well, it's there, we're teched up to the eyeballs. It's all sampled digital stuff but it's not the typical style," Wynne elucidates. When I ask what their audience is like, he offers: "A cross-section really, anyone and everyone. But not so many straight people, completely straight people". "You'll see it tonight," adds bassist Zia Jelani. He's right, the audience at the Astoria Theatre, where Ozric is kicking off its European summer tour with a record release party/concert tonight, is indeed a heady blend of the many musical tribes that have crossed the musical plain over the years: Long-haired hippies, spiky punks, baggy Stussy'd housesters, gray-area neutrals and, yes, straights - all jumping up and down and dancing with abandon to the instrumental Ozric attack. Instrumental is the name of the game with Ozric Tentacles. "The tunes have got the odd little words on them, but not very much, not a great deal. And that's what we do, it's our trait, that's the way we write," Wynne admits. 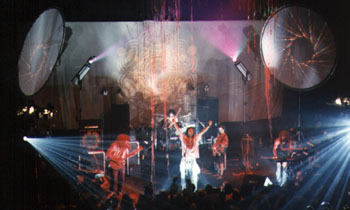 The band's odyssey started in 1983 in South London. "We would go to festivals and play free gigs, and then we played little clubs in London, then bigger clubs. Then somebody came and we got a deal and made a record." Arborescence is the band's 13th UK album, all for the label Dovetail; IRS has domestically released its past two albums, "Jurassic Shift" and "Strangeitude", along with the newest "Arborescence". One of IRS's marketing angles is sending promo copies of the CD to what it calls its "bohemian" mailing list of coffee shops, clothing boutiques and book stores. And there is indeed a kind of synergy between the band, its audience and the neo-bohemian crowd that frequents coffee houses and thrift stores. 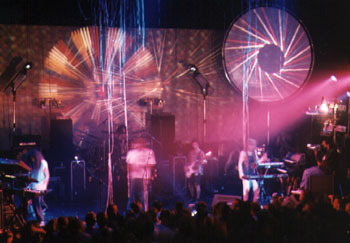 It attracts a spaced-out audience, seeking the abandon and transcendence in an Ozric performance. And the band and its posse certainly show the way of the space walk. A perfect example: tonight's show was billed as "Ozric Tentacles and Guests," and one of the guest bands, Junkwaffel, driving in from Somerset, took a wrong turn on the motorway and found themselves in Manchester. Imagine a New York band heading to a show in Philly, veering off somewhere on the Jersey side of the Holland Tunnel and not realizing their mistake until they got to Buffalo!!! My loss, I'm sure, for the other guest band, Damidge (which features Wynne's brother and former Ozric bassist, Roly), put on a great show. If you can imagine Iggy fronting Pink Floyd playing the Aerosmith songbook, you can begin to envision Damidge. The band is based in Somerset, "Southwest England, about 20 miles from Bath," Wynne charts. "We bought a mill about two and a half years ago and converted it into a studio where we do our albums and stuff. I live in the mill, but not the rest of the band. It's not a big commune like the rumor has it." Through all of it's lineup changes over the years, leaving Hinton and Wynne the only remaining original members, Ozric has attained UK success without the benefit of airplay (remember, no college radio in England). Wynne seems amused when relating the concession British radio had to make to the band in 1993: "Last year, Jurassic Shift went to No.11, so they had to play a little bit on the radio. So what they did was choose the shortest track, which is the least radio-oriented track on the album, and they thought, 'Oh, We'll play that!' It's called 'Train Oasis,'and it sort of meanders about, and they thought, 'Oh my God! '; they pulled it off and said, 'Well, that was enough of that." In case you're wondering, "Ozric" is an old Viking name meaning "divine energy," and tentacles "is a silly word to put on the end," Wynne explains. The band should be back in the US by the end of this year, and they love American audiences. "They're incredible, actually." Wynne says. "they're so overwhelmingly, exuberantly into it. We couldn't believe it... completely mad people, that's how we found them. Good fun. Enjoyed it. Nice." In contrast, Ozric feels it only partially fits in the UK music scene. "There's a sort of a slot for us, but we can't be lumped in with a lot of other styles of music," Wynne figures. And that can be a problem in England. "We do play a lot of raves, and we seem to be the only band that goes down well at raves, for some reason." Wynne feels Ozric's music can be listened to "...anywhere you can have an armchair journey. Also, people like it driving. It takes the edge off of the traffic." Ozric is an unusual kind of band: clearly linked to specific musical eras, yet timeless in its approach and hard to categorize. Like a musical Cheshire cat, the band moves on to a different frame of reference before you can pigeonhole it, leaving only you with a smile on your face.